Landon Donovan and Jack McInerney stole the headlines over the weekend and deservedly so as both put in man-of-the-match performances for their respective teams. But lost in the glitz of LA’s marquee matchup and Jack Mac’s two goals was the strong play of another young striker out in Utah. Real Salt Lake’s busy offseason to clear cap space was well publicized. Among the salary cap casualties was forward Fabian Espindola, who joined the club in 2007 and eventually formed a very effective partnership with superstar Alvaro Saborio. But with Espindola suiting up for New York this season, a new strike partner for Sabo was surely high on the priorities list for general manager Garth Lagerway and head coach Jason Kreis. 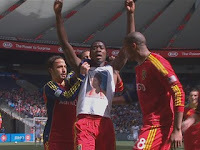 Robbie Findley, who was part of the RSL team that won the 2009 MLS Cup, was expected to step in and fill the void, but with only one goal in five games he has yet to find his best form. 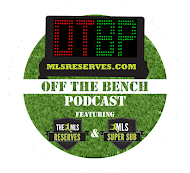 Instead Kreis has turned to a player who’s relatively unknown: Olmes Garcia. Acquired from Deportes Quindio where he scored seven goals in 47 games, the 20-year-old forward came to Utah as a result of the tireless scouting and player evaluation that RSL is famous for. Garcia found playing time hard to come by early on in this year, but performed well in reserve matches and against Dallas, registering a shot on goal with his first touch in a competitive game after being subbed on. But the Columbian really announced his ability to the league in last week’s draw with Vancouver. In the 66th minute, Garcia ran down an unassuming clearance from Lovel Palmer and managed to outmuscle Vancouver’s Andy O’Brien to win possession. After laying off the ball to Javier Morales, Garcia floated to the top of the area, got the ball back, turned, and hit a wicked, curling shot that beat Joe Cannon before finding the upper 90. It was a stunning goal and a play that showed off all of the striker’s best attributes. Kreis rewarded his young forward’s breakthrough with a start in Saturday’s game against Chivas USA. Garcia was in good form again, holding up the ball, linking well with Saborio and moving into the space left by the Goats’ three-man defense. In the sixth minute, he picked up a ball from Saborio, cut between two Goat defenders and launched a shot that Dan Kennedy could only watch as it clanged off the crossbar. Garcia also helped set up the only goal of the night, playing Saborio into the box before the Costa Rican sent in a cross for Javier Morales to head home. RSL will hope Garcia’s form persists and his presence continues to free up space for Saborio and Morales to wreak havoc on defenses. Despite what it lost, Salt Lake is still a legitimate contender and arguably the deepest team in the league. Another goal threat only improves the chances of a deep playoff run. Taking into account RSL’s penchant for developing young talent, Garcia looks like a potential star in the making. Kreis and Lagerwey have once again unearthed a gem that RSL fans will hopefully be cheering for years to come. He is a terrific young player. Explosive and exciting. Also, I think the embeded videos are switched.